Rainbow Bridge has water under it when Lake Powell is at full pool. Rainbow Bridge has sometimes been referred to as the largest natural bridge in the world, but this is now known to be incorrect by any standard. Gunniess World Records 2008 even lists Rainbow Bridge as the highest natural arch in the world. This is also incorrect. There are a fair number of natural arches that exceed Rainbow Bridge in height, topped by Tushuk Tash with a height of 1200 feet. In 1974 the Bureau of Reclamation reported the span of Rainbow Bridge at 275 feet and the height at 246 feet. A more recent measurement in 2007, using precision laser ranging and a mathematically precise definition of "span," resulted in a span of 234 feet and a height of 245 feet. Whatever its statistics, magnificent Rainbow Bridge is truly one of the wonders of the world to behold. 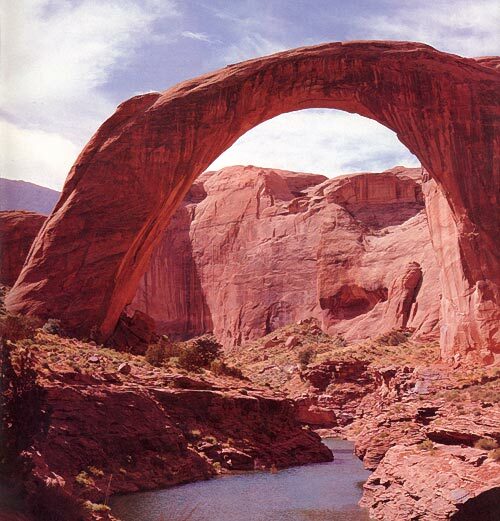 Rainbow Bridge is an adult meander natural bridge eroded through Navajo sandstone. Click here for a 3D photo of Rainbow Bridge. Rainbow Bridge is in Rainbow Bridge National Monument, Utah, next to Lake Powell. The easiest way to visit this arch is by boat on Lake Powell. Boat tours from Wahweap Marina provide half-day tours and full-day tours (the latter allows you to see more of the side canyons on Lake Powell). You can get further information or reservations online or at 1-800-528-6154. Rainbow Bridge can also be reached by either of two strenuous and beautiful backpacking trails around Navajo Mountain. The southern route is about 13 miles one way. The northern route is easier to hike but harder to get to and is about 14 miles one way. The northern route also goes by another significant natural arch called Owl Bridge. This beautiful arch has a span of 61 feet and a height of 63 feet. With a car shuttle, you could go in one trail and out the other. It is also possible to arrange to hike in and then go out by boat. There is no camping within the National Monument itself. All of this hike except the small amount in the National Monument is within the Navajo Nation and a permit from the Navajos is required. Most of the route is on the 7.5 minute topographic map Rainbow Bridge, Utah. For the northern route, you will also need the Navajo Begay, Utah, 7.5 minute map. The very beginning of the southern route is on the Chaiyahi Flat, Arizona, 7.5 minute topo map. A controversy developed concerning access to Rainbow Bridge in May of 1995 when Rainbow Bridge National Monument issued a flyer entitled "Respect for Tradition" which urged visitors "please do not approach or walk under Rainbow Bridge" because, it said, the American Indians consider it a sacred religious site. "People are now asked to stay on the trail and avoid walking beyond the viewing area at the end of the trail." Later that year the Park Service imported some boulders to discourage access to the trail under the Bridge, and they also placed Park Service personnel at the site to dissuade visitors from going under the Bridge. The Park Service flyer stated that "long before its 'discovery' by white explorers, American Indians considered Rainbow Bridge a sacred religious site." According to the late NABS Director Stan Jones, an expert on the history of Rainbow Bridge, there is no evidence for this assertion. Jones stated that the Navajos paid little attention to Rainbow Bridge until large numbers of people were brought there by the tour boats on Lake Powell. NABS issued a detailed critique of this Park Service policy in 1996 written by NABS member Harvey Leake (the grandson of Rainbow Bridge co-discoverer John Wetherill), concluding that the policy was of questionable legality. However, a United States District Court decision in 2002 upheld the Park Service policy, pointing out: "Although some visitors may feel social pressure not to walk to or under the bridge, that in no way transforms the voluntary request into a mandatory policy. In fact, there is no officially imposed consequence for choosing to walk to or under the bridge." In 2001 the National Park Service published a book entitled A Bridge Between Cultures: An Administrative History of Rainbow Bridge National Monument. This book is available for free download from the NABS Download Page.